There is a saying that we take two steps forward, one step backward. But this is still progress. Well Saturday, we took two steps backward, so I waited anxiously to see if we could claim some of that progress back. Well, we did. It may have been hard for fans to see it because we are still all seething from Saturday’s debacle, and many have already placed Allegri’s head on a platter. But if you take a deep breath and sit back and think about the match, it was progress. Could this be an actual TEAM? Consider the recent statement from Zvonimir Boban: This is the worst Milan side in 25 years. Can anyone really argue with that? I can’t. And tonight we faced the current champions of the Belgian league. Sure, you say, it’s the Jupiler league. But they do have a higher UEFA rating than Juventus. And they are certainly a better team than Atalanta, who actually beat us on Saturday. So if you were expecting anything better than a draw, you may want to rethink your expectations. This is Budget Milan™. We would be lucky to stay in the game. And stay in the game we did. For a coach under fire, his tactics and lineup were a vast improvement from the team he lined up on Saturday. I would absolutely say Allegri took two steps forward. The team maintained 53% possession. We took 20 shots, only 4 of which were considered on goal, but those chances were all very dangerous. In fact Anderlecht took 14 shots, but only 2 were on goal, we certainly looked better than them on goal. The big surprise for me? Our defense. Bonera had a great game, until he went off injured, and Mexes was huge a number of times, too. Like when Bonera schooled the young Bruno in the 40th, for example. De Sciglio was awesome as usual with amazing crosses, and Antonini… well, 3 out of 4 defenders is better than what we’ve been doing. Our midfield is still problematic, but then again, I’m not sure why Flamini played at all, other than maybe his Champions League experience. Nocerino did a lot, even got a couple of shots off, but hasn’t quite found the magical form he was so loved for last season. De Jong has been surprisingly disappointing. If you’ll recall, it was his error that led to the goal on Saturday, and he had a couple of questionable plays today, too. But overall, he is a very welcome addition, and adds a lot of quality to the midfield. Our attack… Allegri seems to think Pazzini is Ibra, and he’s not. He’s much more like Inzaghi, you know the striker he would never play the past two years? And we don’t have the support strikers that Pazzini needs to do well. Changing to the 4-3-2-1 was a huge improvement, Urby and Boateng rocked that before in the preseason. But Boateng has been very off since then, more so after his surgery, and should perhaps consider never taking a shot again. To be fair, he took at least 2 shots that were on goal, even if they were straight into the keeper’s arms. Urby is as inconsistent a shooter as ever, but at least he is better at providing crosses. But Pazzini was double-teamed often, and he doesn’t shrug off defenders or wear them while shooting like Ibra did, he is but a mere mortal, so will also need more defensive help in the box, too. I normally do more of a recap, but in the interest of time, I’ll keep it brief…Bonera and Mexes saved our behinds time and time again, especially in the first half. In fact, Bonera only had one clumsy tackle in the 33rd, and even that was forgivable (especially since he didn’t get a card for it.) Although Mexes loses points from me for that wild chicken version of a mohawk he was sporting. Antonini was dispossessed more often than Seedorf on an offday. His crosses were largely ridiculous, apparently we’ve gotten our one good game out of him. Boateng shot better today, but still is committed to out-Sky Joust Robinho. Urby is great, but he can he shoot? The first yellow of the match went to Wasilewski in the 57th for a very nasty tackle on Pazzini. Pazzini is one tough forward. The next was to Sacha Kljestan in the 80th for a high boot on Flamini. Not to be outdone, Flamini claimed his own yellow in the 84th, and Mexes, feeling left out, got one in the 92nd. Allegri was spot on in his substitutions. He brought on El Shaarawy in the 60th for Boateng. While the latter was visibly upset and threw a water bottle after having been subbed, El Shaarawy invigorated the team and had a beautiful shot in the 64th that was unfortunately saved by an equally amazing save. In the 74th, Allegri was forced to substitute Bonera for Yepes, the former apparently injured. And his final sub was in the 78th, bringing on Constant for Urby. All excellent subs, a shame about Bonera’s injury, as Bojan had also been warming up. 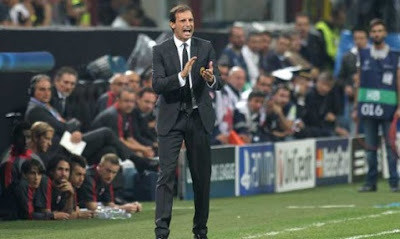 Allegri was certainly looking to attack and claim the victory. Pazzini wasn’t completely disabled by the two defenders always flanking him, he had some almosts. Some good crosses from De Sciglio and Urby, and some UFO style crosses from Antonini, and still he nearly headed or tapped some in. Urby and Boateng had the attacking mindset without the finishing skills, I really don’t know how to help them more than just making them shoot for hours every day before or after training. El Shaarawy was fantastic tonight, and it would have been great to see Bojan in the Champions League spotlight, too. Attendance was pathetic, the reaction I’ve seen so far ranges from rage to despair, but I can’t help but be optimistic. We kept a clean sheet, got a point, and improved our game a lot since Saturday. For me, that is progress. And to see Ambrosini and the others on the sidelines visibly and outwardly encouraging their teammates, I think I felt the spark of belief in this team igniting in my heart. I definitely think we made at least two steps forward. No, this isn’t our Milan. It’s not even the Milan of our parents’ day. But it is Budget Milan™, and tonight they took two baby steps forward. I can’t begrudge that, even if I’d love to see a team to contend out there in the red and black. With a little patience, a lot more support from fans, and… well, possibly a new coach in the future, this team could prove some people wrong by the end of this season. Progress. Parma vs. Milan: Game On! Milan 2, Cagliari 0: The Curse is Broken! Milan vs. Cagliari: Game On! Udinese vs. Milan: Game On! Champions League - Milan vs. Anderlecht: Game On! Milan vs. Atalanta: Game On! How Much Should a Scudetto Cost? Bologna vs. Milan: Game On!